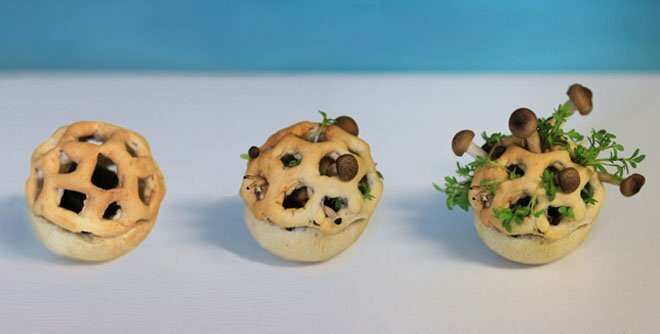 These aren’t your typical, digitally fabricated pizzas and burritos, but living foods that are 3D-printed and naturally mature into delicious edibles through fermentation and photosynthesis. The idea of 3D-printed food doesn’t typically conjure up images of healthy, wholesome food; rather, we are more likely to think of pizzas, burritos and chocolate. But can this technology, which is already promising to change the medical prosthetics and building industries, also change the food industry as we know it, while providing the nutrients that everyone needs? That’s the hope of Chloé Rutzerveld, a designer and recent graduate of Eindhoven University of Technology. 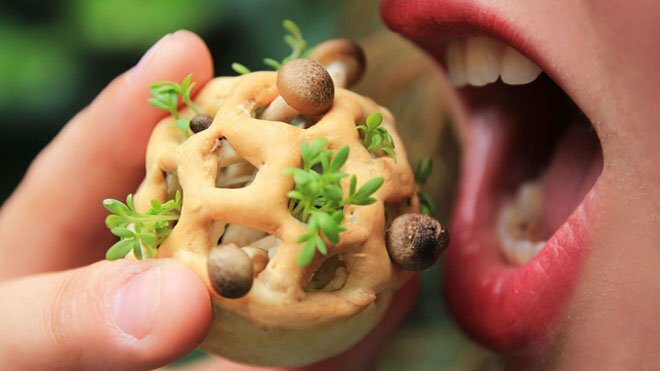 Working with additive manufacturing experts, bio-technologists and scientists from the university and from the Netherlands Organisation for Applied Scientific Research, she has developed Edible Growth, a “future food” concept for digitally fabricating what she calls “healthy and sustainable food,” 3D-printed using living organisms like fungi and sprouts. 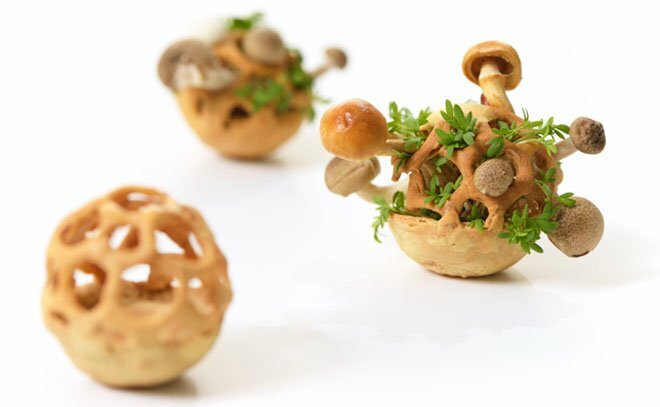 The concept is to print an edible base that also serves as a growth medium for mushrooms and flavorful plant foods, that eventually grow in a healthy and tasty bite-sized morsels. 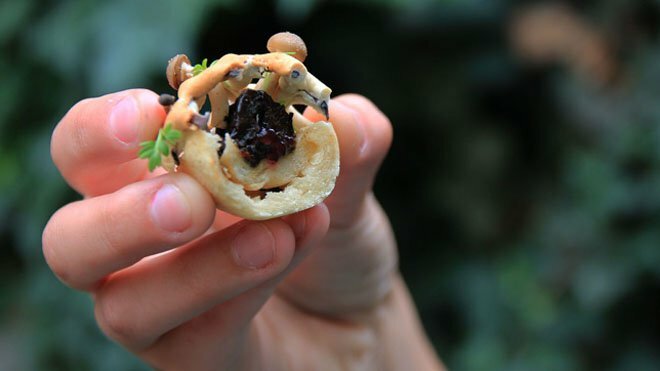 Here’s how these little culinary delights are created: edible layers of seeds, spores and yeast are customized according to taste, and are then digitally printed. Within five days, the plants and spores mature, as well as the yeast, which ferments the solid interior into something more liquid. Prior to consumption, the morsels are allowed to develop naturally, according to the consumer’s desired flavor intensity. There is much more reliance on nature’s processes here, like fermentation and photosynthesis, making Edible Growth an intriguing departure from the junk food offerings that we’ve already seen being offered by prototypical machines like the pizza-printing Foodini and the BurritoBot, which have more novelty appeal in forms and colors than true nutritional value. That’s why the Edible Growth project is compelling — it addresses the current lack of nutritious food in the 3D printing industry, proposing something that ardent health food lovers may even warm up to. Because you can’t feed the world with pizzas, this approach may eventually become one way of solving world hunger and sustainably feeding growing populations on limited resources. Not only is there potential for better overall nutritional value, there is also potential to completely overhaul and shorten the food industry’s supply chain. The edible is printed on-demand, with the precise amount of required raw materials available inside sterile, recyclable packaging. This eliminates the need for vast amounts of arable land, pre-packaging, preservatives, distribution and storage, and there is little to no food waste. Any risk of contamination is minimized by printing the food inside a reusuable package, in a sterile environment with controlled temperatures. Besides the possibility of overhauling an inefficient and wasteful food system, there’s also a bit of gourmet cachet to these living tidbits of mushrooms and watercress, since the combination of tech with living food is nothing like we’ve seen before. Rutzerveld’s edibles have received a lot of positive comments on taste and appearance from unsuspecting testers and chefs alike, and she believes that this kind of convergence of technology with gastronomy can open up new avenues of culinary expression and appreciation. We then use new technologies as tools to facilitate or enhance the natural. Rutzerveld notes that because many people are becoming more aware of what they eat and how it is produced — there is a growing demand for “pure, natural and healthy food” — a product like Edible Growth will catch on in the midst of evolving perceptions of food and health. Because the product matures at the consumer’s house and people can harvest their own product at the preferred stage, they become more involved and conscious of the food they eat. New production methods can make different textures, structures and molecular compositions which might require new ways of eating. 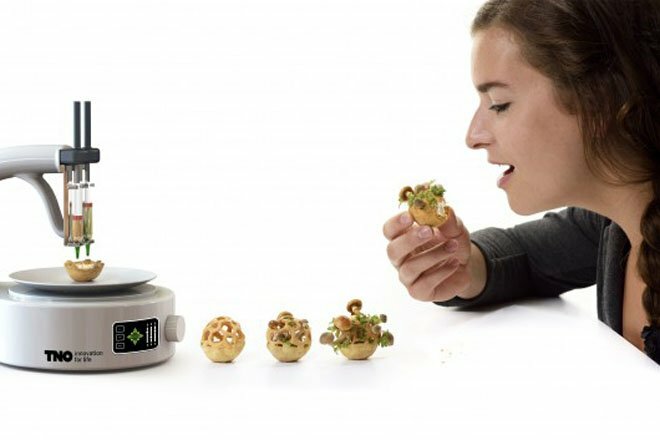 Due to time and funding constraints, the Edible Growth concept remains in research and development, so there is no actual printer yet that will print these living edibles that grow and mature into full-fledged healthy foods at home. Much of the team’s testing involved viable seeds, edible breeding grounds, fermentation processes and mushrooms to refine the process. But the idea has struck a chord for those who believe that 3D printing technology will one day transform the way we produce and eat food — hopefully for the healthier. Find out more over at Chloé Rutzerveld. All images via Chloé Rutzerveld.